Jerusalem, Israel — December 20, 2016 … More than five years after it began, the Syrian civil war has killed a reported 470,000 people. Bombings are destroying crowded cities and horrific human rights violations are widespread. Basic necessities like food and medical care are sparse. The U.N. estimates that 6.1 million people are internally displaced. Over half of Syria’s pre-war population of 22 million is in need of urgent humanitarian assistance, whether they still remain in the country or have escaped across the border to Jordan, Iraq or Turkey. 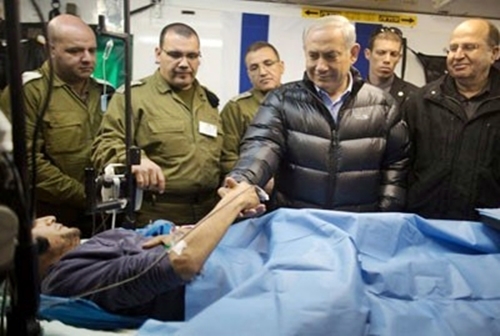 Israel wasted no time in establishing field hospitals on the Israel Syrian border. To date, Israel has treated thousands of Syrians but now feels the need to provide even greater assistance. Israel has and will continue to provide food and clean water, shelters and provide families with clothing, mattresses and other household essentials. The Jewish nation will help children cope with extreme stress and lead constructive activities to nurture their healthy development. One such Israeli-run, IDF field hospital on the border, the Ziv Medical Center, has treated more than 2,500 Syrians since 2013, when the civil war began, according to Dr. Salman Zarka, the hospital’s director. Netanyahu’s announcement today marks the first time Israel has offered to take Syrians wounded on distant battlefields into Israel itself. The Syrian city of Aleppo, which has been the bloody epicenter of the fight for control of Syria for the past year, is located over 400 miles away from the Israeli border. All Syrians allowed into Israel will go through an extensive vetting process which will assure that only Syrian civilians who never served as combatants will be provided with shelter and medical treatment. The State of Israel takes great pride that it welcomes all religions into her cities and towns. Hundreds of Muslims and Christians serve proudly in the IDF and enjoy the only free and secure democracy in the Middle East.